An amazingly vegetable hyderabadi biryani with chopped vegetables and spices is a great way to enjoy gathering with your family and guests. Cook the rice such that each grain of the rice is separate. Add the saffron milk mixture to the rice and mix well. Divide the rice into two equal portions and keep aside. Heat the oil in a kadhai and deep fry the onion slices till they turn crisp and golden brown in color. In the same oil, deep fry the cashewnuts, almonds and raisins till golden brown. Drain on an absorbent paper and keep aside. Heat half the ghee in a deep pan, add the cloves, cardamom and bayleaf and sauté on a high flame for a second. Add the onions and ginger-garlic paste and sauté till onions turn transculent. Add the mint paste, coriander paste, biryani masala, salt, all the vegetables, cream and remaining milk. Cook on medium flame till all the vegetables are cooked. Remove from the flame, cool it on room temperature add the beaten curds and mix well. Divide the gravy into two equal portion and keep aside. Heat the remaining ghee in the deep vessel, sprinkle little fried onions, than spread the one portion gravy and top with rice. 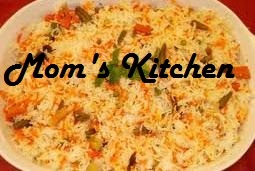 Spread fried onions, cahewnuts, raisins, almonds and coriander evenly on the top of the rice. Cover the vessel with the lid and seal it with the dough and allow to dum for half an hour.